Subtitled, "A Manual of modern North Country methods", this one is a classic and in many ways has never been improved upon. First published in 1916, it appeared in a very limited edition of 50 copies, each one of which contained twenty mounts of artificial flies and fly tying materials; interestingly, most copies contain flies that were tied by Hardys’ rather than the authors, but this edition still commands a tremendously high price thanks to its rarity. A trade edition of 1000 copies followed and for many years this served as the North country fisherman’s Bible - I remember being handed a copy when I was learning to fly fish - a copy of this edition fetches about £100 in good condition nowadays. The book has been reprinted twice, once by Smith Settle, back in 1997 and more recently as a paperback by Coch-y-bonddu books. It is amazing to think that a book like this had to be self-published by the authors, but true to form, the trade edition printing took many years to sell out, despite the demand that has sprung up for it nowadays. 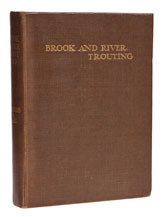 The original editions contain a list of dressings, together with rather beautiful colour illustrations and a few general chapters about how to fish them - readers are often surprised to find that a substantial section of the book is devoted to worm, creeper and minnow fishing, but it is none the worse for it.